The NCBO Resource Index is a system for ontology based annotation and indexing of biomedical data; the key functionality of this system is to enable users to locate biomedical data resources related to particular concepts. 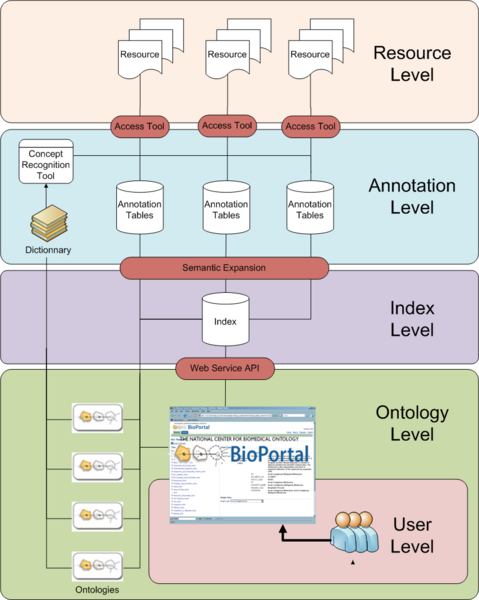 A set of annotations is generated automatically and presented through integration with BioPortal, enabling researchers to search for biomedical resources associated (annotated) with specific ontology terms. This service uses a concept recognizer (developed by the National Center for Integrative Biomedical Informatics, University of Michigan) to produce a set of annotations and expand them using ontology is_a relations. The system's indexing workflow processes the text metadata of diverse resource elements such as gene expression data sets, descriptions of radiology images, clinical trial reports, and PubMed article abstracts to annotate and index them with ontology concepts. Researchers can then search across these biomedical data sources by the ontology concepts. Reference Paper - A System for Ontology-Based Annotation of Biomedical Data. C. Jonquet, M. A. Musen, N. H. Shah. International Workshop on Data Integration in The Life Sciences 2008, DILS'08, Evry, France, Springer-Verlag, 5109, Lecture Notes in BioInformatics, 144-152. Published 2008. For more information and developer documentation to the NCBO Resource Index API, see the wiki. The Resources Index architecture is comprised of different levels. Please see reference paper for details.